September serves as National Preparedness Month, which is a reminder that we need to continue to reinforce the four building blocks of emergency preparedness: Stay Informed, Make a Plan, Build a Kit and Get Involved. The theme for this year is “Disasters Happen. Prepare Now. Learn How.”, which stresses the importance of being prepared for an emergency throughout the year. 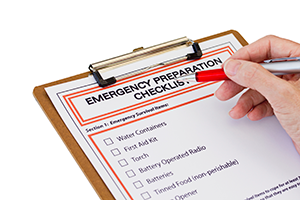 Each week in this month, we recognize the importance of preparing for an emergency through weekly topics. Through the weekly topics and various resources provided by the Office of Public Health Preparedness and Response, you will find twitter chats, tool kits and blog posts that discuss and highlight the message of each week. To access either the blog or twitter chats go to Ready.gov to get more involved in Emergency Preparedness month. At PCHC, we are committed to providing resources and relaying information that will help individuals prepare for the hazardous situations that can take place. PCHC currently provides the Everybody Ready 3.0 guide, a local resource that contains tools to assist those with a functional need in an emergency situation. Along with the Everybody Ready 3.0 guide, PCHC offers a “Personal Preparedness” training which was developed in conjunction with the Philadelphia Department of Public Health. PCHC also offers an “Emergency Preparedness” training online, click here to take the training. PCHC is able to provide agencies, staff and individuals with information and details on how to best prepare for emergencies through this training. The training registration form can be located on our website alongside additional emergency preparedness materials. To receive monthly tips relating to emergency preparedness text the word PREPARE to 43362(4FEMA) or sign up for alerts through Ready PA.